York Watergate is all that remains of the York House. It was once the gateway that led from the Duke of Buckingham’s gardens to the river. The gate itself is stone with two lions holding shields with anchors above – commemorating Duke of Buckingham’s service as Lord High Admiral. Now separated from the river by Embankment Gardens – opened in 1870. Schemes to embank Thames date back to Christopher Wren in 17th century. Some embanking in 18th century but not till middle of 19th century was river fully embanked as part of an attempt to improve sanitation by Joseph Bazalgette, chief engineer of the newly founded Metropolitan Board of Works (1855). Embankments started in 1868 and finished in 1874. Narrowing the river increased its tidal range and helped flush out sewage that flowed into the Thames. Bazalgette’s schemes also involved creating an entirely new sewage system which has served London till today ( though a new tunnel beneath Thames is being built to improve sanitation). Embankment also contained new underground railway line for District and Circle lines, and new street to relieve traffic congestion on Strand. The Riverside plots attracted Bishops and noblemen who built a string of Medieval 'palaces'. John of Gaunt, first Duke of Lancaster, lavished £35,000 on the Magnificent Savoy House in the 14th Century. Later Elizabeth 1st gave her favourites homes here - Sir Walter Raleigh got the bishop of Durham's Mansion. 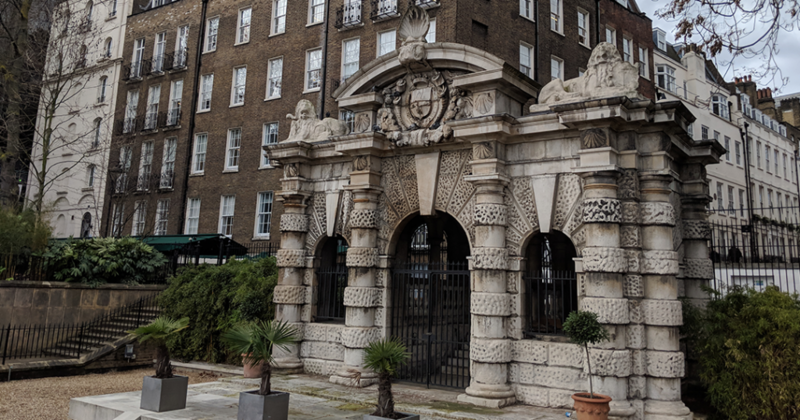 A lone remnant of this grandeur is the Watergate of York House, the home of the Archbishop of York and then of the Duke of Buckinghamshire. It stands well inland in what is now Embankment Gardens. At the other end of the Strand, Somerset House was completed in (1550) and served briefly as a Royal residence. It was demolished in (1775) and the present imposing building was completed in (1885).